October is Breast Cancer Awareness Month. To help increase awareness and raise funds, Bill Harris GM will be participating in a variety of events throughout the month to help support this very worthy cause. The first opportunity you can help us in our fight against breast cancer is coming up this Saturday, October 6th. 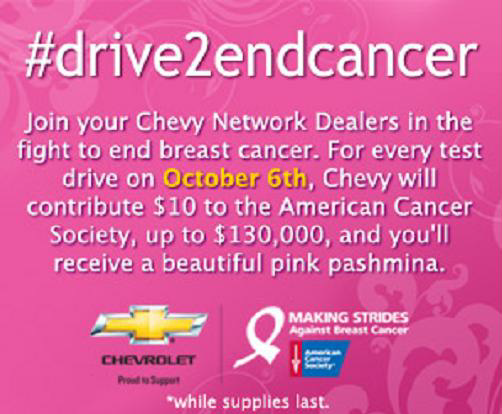 For every test drive on Saturday, October 6th at Bill Harris GM, Chevrolet will contribute $10 to the American Cancer Society, up to $130,000. As a special incentive, each woman who takes a test drive at Bill Harris GM on October 6th will receive a beautiful pink pashmina scarf (while supplies last). 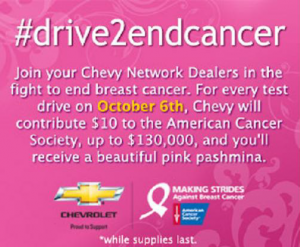 From October 8th – 26th, for every new “Like” to the Gotta Love Chevy NEO Facebook page, $1 will be contributed to the American Cancer Society Making Strides Against Breast Cancer Initiative (up to $1,350). In addition, every Facebook Fan will have the chance to enter to win one of three “Fan-Tastic Chevy Girl Makeovers” in their special October sweepstakes designed to pamper their fans. Together, we can help ensure more birthdays for all the women affected by breast cancer. 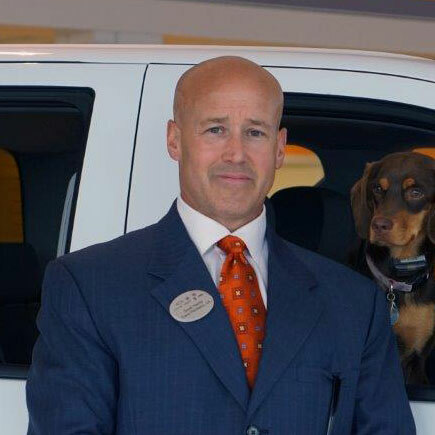 Be sure to visit our Facebook page often, www.facebook.com/billharrisdealerships, to see all the opportunities that you can help us support the fight against breast cancer.